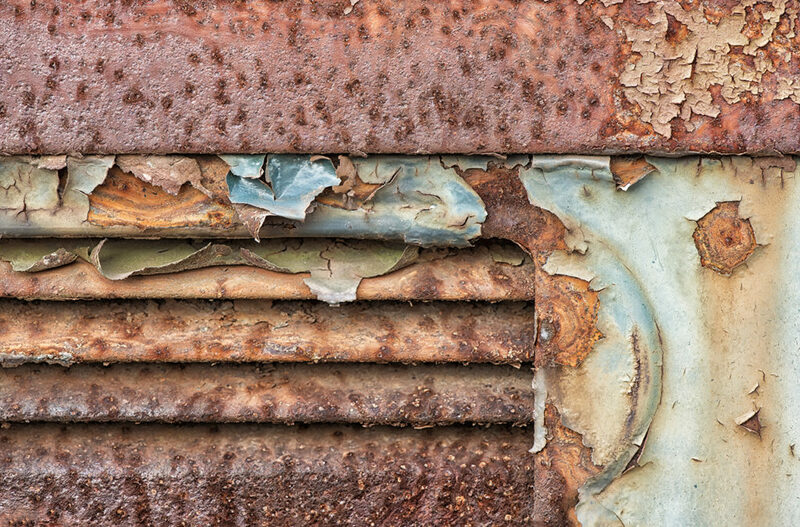 About a month ago, I joined the Rust Art Group on Facebook and have been enjoying the beautiful images of intricate patterns, colours, shapes and textures that the other photographers post there every day. 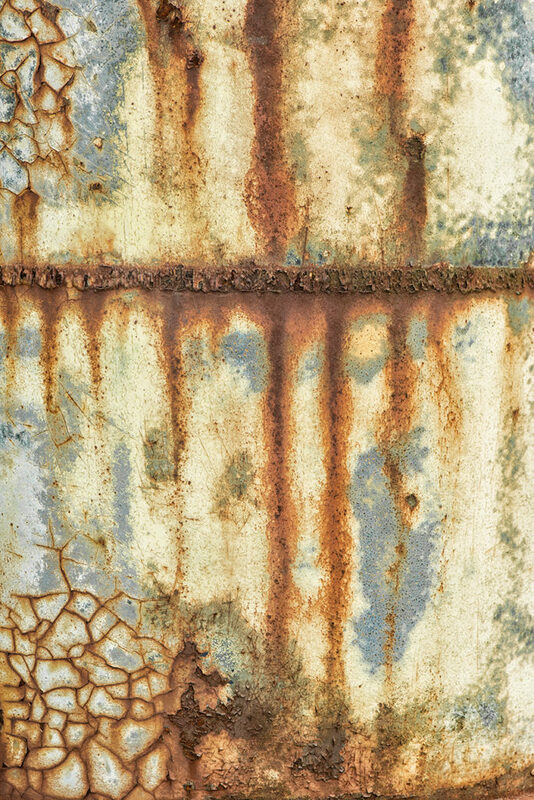 I never would have imagined that such beauty could be created by rust but, seeing what other photographers do with their rusty subjects, I have no doubt that it rises to the level of art. It’s also an interesting contrast for me to participate in a group which is comprised mainly of European photographers: most of the members seem to be from Germany, Holland, Poland and there are several members from Israel. Their aesthetic is certainly different from that of the American photographers with whom I normally hang out. They seem to celebrate hardest when a group member posts a rust pattern that resembles a human face or an animal. For my part, I prefer the more abstract images, which emphasize colour and shape. 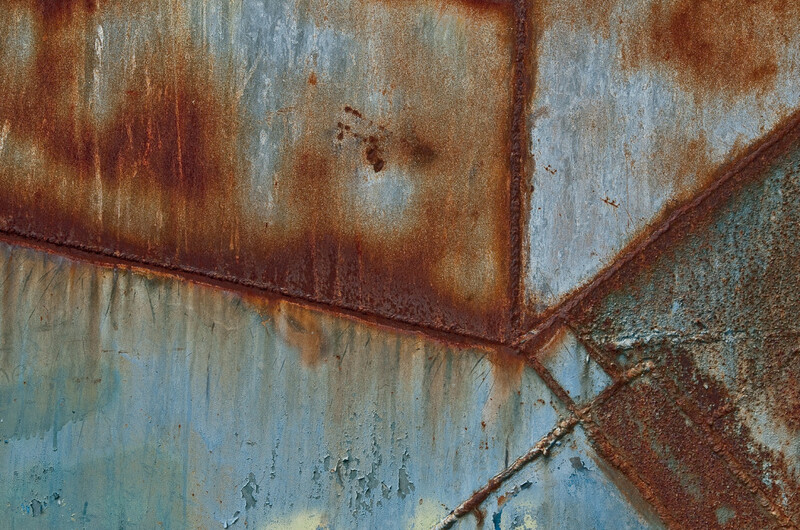 I also like images with geometrical patterns, that resemble Piet Mondrian paintings, like the second image posted here, which is of the side of an old, steel-grey, rusted water tank that had been welded together: the ridges where the welder had done his work made for interesting lines in the composition. 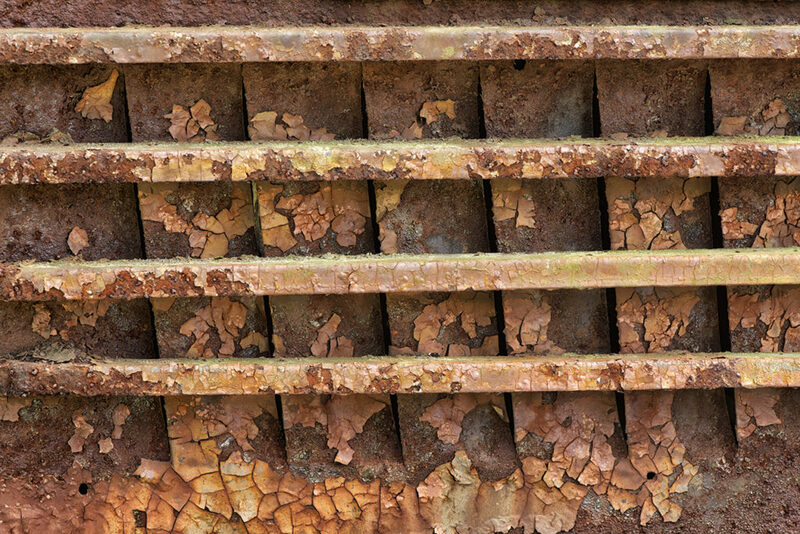 I have never photographed rust as a subject in its own right. But, when I looked back through my images for photos that might be suitable for posting in the Rust Art Group, I was surprised to find that I had taken quite a lot of photos of rust. 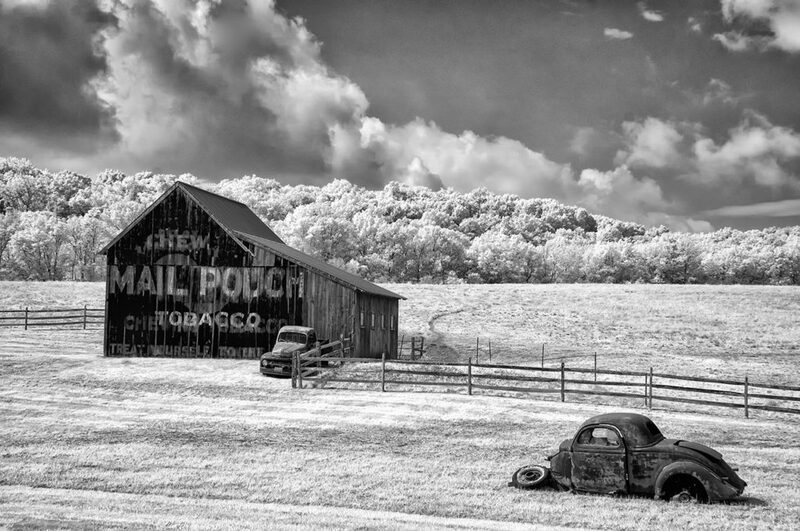 I suppose this comes from my love of photographing old cars and trucks, as well as abandoned industrial buildings. 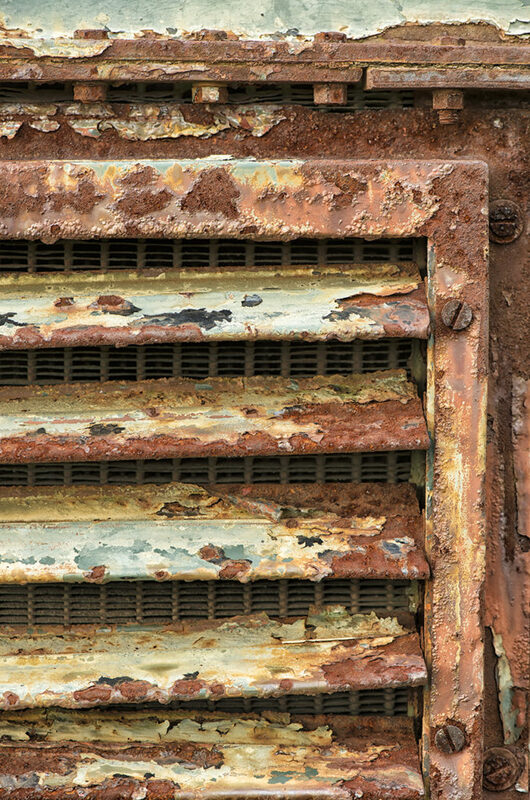 Enthused by the work of the other photographers in the Rust Art Group, I headed out last Saturday to a truck graveyard in rural Virginia with the specific intention of capturing images of rust. Shooting with a Nikon D800 and Nikkor 105mm f2.8 micro lens, I found that “seeing” rust images was not so dissimilar to other types of photography: I was looking for line, shape, colour and, of course, texture, as well as interesting or repeating shapes. With the dominance of warm tones in rusty subjects – reds and browns – I was on the lookout for cooler colours to add contrast, such as the pale blue in the image at right. In post-processing, I found it best to emphasize texture by using the Tonal Contrast and Detail Extractor filters in Nik Color Efex Pro 4. Frequently, I had to dial back the saturation, as images with a lot of rust can easily look too warm. 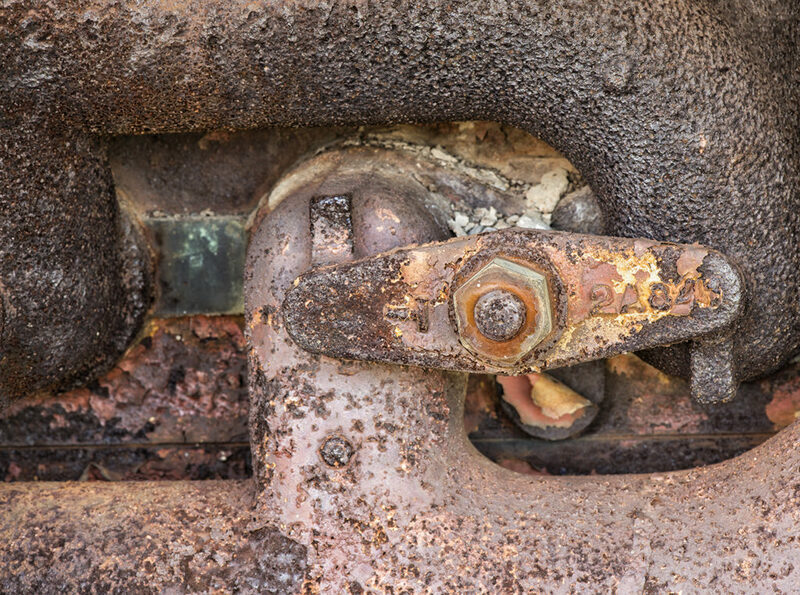 I enjoyed my foray into the world of rust macro photography and like some of the resulting images. This is a subject I will be shooting again in the future. Not having picked up a camera in more than a month, I have been mentally struggling to figure out how I would get back into taking photographs. In the almost six years that I’ve been pursuing photography seriously, this was the first barren period I’d experienced. Prior to this, my enthusiasm for photography had never waned but, this time, not only was I not taking any photographs, I wasn’t missing it. Not that this period away from my camera was fallow: far from it. Rather, I threw myself into other creative pursuits, principally playing guitar, which has long been one of my great pleasures. And I tried my hand at songwriting. Writing songs is something that has interested me in quite a while. I have always loved music, particularly song, play guitar reasonably competently, have an okay singing voice and people keep telling me I can write, so songwriting seemed like a natural direction for me to explore. I’ve been taking a six-week MOOC (Massive Open Online Course) conducted by the prestigious Berklee College of Music in Boston and run through Coursera. The course has been enjoyable, challenging and surprisingly hard work, involving about ten hours of study each week. Having written, recorded, played and sung on my first two songs, the principal lesson I learned was: it’s time for me to get back into photography! 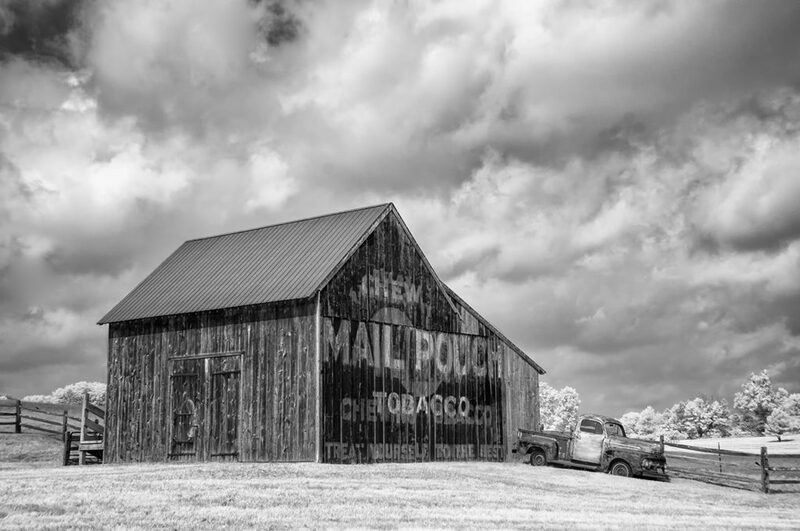 I have a longstanding invitation from my friend Ray, who lives in Pennsylvania, to go and shoot an old wooden mill and a Mail Pouch barn with a rusty truck parked in front. Knowing these have long been among my favourite subjects to shoot, I thought that, if anything could rekindle my passion for photography, a mill, a barn and a truck should do it. So, I drove up to PA on Saturday afternoon, spending the evening with Ray, drinking beer and talking photography and we headed out at 4:30 on Sunday morning to shoot the mill in what we hoped would be the sweet morning light. The light didn’t materialize, held back by heavy cloud cover than sat over our heads like a gigantic, stubborn pancake. 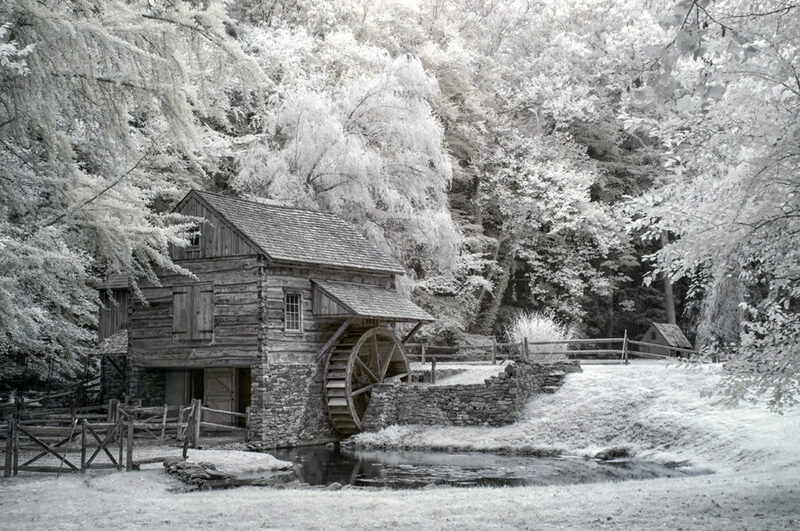 Colour images looked flat and lifeless, so I shot a few frames of infrared and was reasonably content with them. Moving on to the Mail Pouch barn for the second half of the morning, the light improved, the pancake cloud broke up and we got some pleasing cloud formations and intermittent rays of sun, which made IR the way to go. The images featured in this blog post are the best of my morning’s work. It felt good to get back to shooting again. And I have to say a big “thank you” to my friend Ray for dragging me out of my photographic torpor.